The redesigned version has been rolled out on mobile devices, so you should be able to take a look at it right now. Compared to the previous look, the headline and body copy appear bigger now. Google has also changed the font that makes the ads look more visually appealing than before. Another key highlight is the text ads now feature elements such as a shaded background and a centered button, which according to Google “bring together the parts of the ad into a cohesive whole.” In the blog post, Clyde Li, AdSense Software Engineer explains that “the look and feel is inspired by material design, like richer text ads” that were launched earlier in 2015. Looking at the comments left by users on the blog post, it would seem the response to the changes is largely positive. 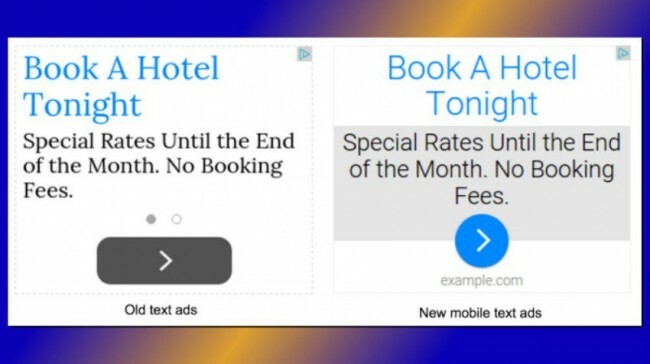 Google’s latest move to give a new look to text ads on mobile seems largely influenced by Facebook’s growing interest and popularity in this space. Facebook has been eyeing mobile ads for some time and trying to catch up to Google. Last year, the social networking company reported mobile ads represent 59 percent of its overall ad revenues. For Google, on the other hand, the ride is turning out to be quite bumpy. Even though Google’s ad business grew 16.5 percent in the same quarter, it was less than what was expected. To stay on top of its game, Google is taking some important steps. In October, the company announced its AMP project to accelerate mobile page loading times. The following month, Google revealed the fast loading mobile pages with ads will be coming in 2016. The AMP initiative will reduce mobile data usage and curb ad-blockers that have impacted the company’s ad revenue. The message is pretty clear: Google doesn’t want to lose its share of the mobile advertising pie. Updating the look of mobile ads is probably one of the many changes it has in store. It will be interesting to see what the next move is. Mobile Shipments Again Growing, But is Plateau in Sight?